SEOUL, South Korea and MEXICO CITY, Mexico, Dec. 5, 2017 /PRNewswire/ — The Cultural Corps of Korean Buddhism held a promotional event for Templestay and Temple food at the Korean Cultural Center in Mexico City, Mexico, November 28 – 30, 2017. The aim of the Cultural Corps of Korean Buddhism’s (President: Ven. 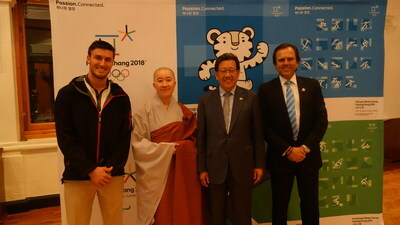 Wonkyeong) event was to introduce Templestay and Temple food to promote traditional Korean culture and raise awareness for a successful 2018 PyeongChang Winter Olympics in Korea. This event was sponsored by the Korean Cultural Center of Mexico (Director: Song Gi-jin). Meanwhile, other events with lectures, Temple food sampling, brass rubbing and postcard writing for Templestay and Temple food will take place in Argentina and Brazil December 5 – 9.